Mestrius Plutarchus (c. 46 - 127), known in English as Plutarch, (in Greek Πλούταρχος) was a Greek philosopher, biographer, and essayist. He was a Middle Platonist and was known to have written a number of philosophical treatises. While a large number of semi-philosophical writings survive under the title of Memoria, his more technical philosophical treatises were all lost. Consequently, Plutarch is far better remembered for his biographical works than philosophical contributions. Among his approximately 227 works, the most important are the Bioi paralleloi (Parallel Lives), which describes the characters and recounts the noble deeds of Greek and Roman soldiers, legislators, orators, and statesmen. The biographies, which paired Greek and Roman subjects in comparisons which were sometimes rather forced, are an important source of historical information. 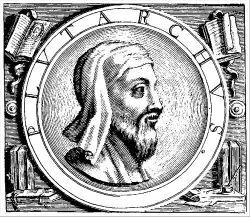 Plutarch’s Lives provided the material for many stories and poems during the Middle Ages, and influenced English and French literature from the sixteenth through the nineteenth centuries. Shakespeare and other Elizabethan dramatists used a translation by Thomas North as a source for many of their historical plays. The Moralia, or Ethica, is a series of more than 60 essays on philosophical, religious, ethical, political, physical, and literary topics. Plutarch was probably born in 46 C.E. in the small town of Chaeronea, in the Greek region known as Boeotia, probably during the reign of the Roman Emperor Claudius. His parents were wealthy people, and after 67 C.E., Plutarch traveled widely in the Mediterranean world, including two journeys to Rome. Plutarch studied philosophy, rhetoric, and mathematics at the Academy of Athens. He never became a staunch Platonist, but remained open to the ideas of other philosophical schools such as the Stoa and the school of Aristotle. It is thought that Plutarch was present when the emperor Nero, who visited Greece at this time, declared the Greek towns to be free and autonomous. In the 90s, Plutarch, returned to his home town. Once, when asked why he had returned to the province, he explained that Chaeronea was in decline and that it would be even smaller if he did not settle there. For some time, he was mayor of Chaeronea. He was initiated into the mysteries of the Greek god Apollo, and served as the senior of the two priests of Apollo at the Oracle of Delphi (where he was responsible for interpreting the auguries of the Pythia). He led an active social and civic life and produced an extensive body of writing, much of which is still extant. Plutarch’s books brought him international fame, and his home became a private school for young philosophers. He was often visited by eminent Greeks and Romans. Plutarch died after his procuratorship, which was in 119, and before 125. The Delphians and Chaeroneans ordered statues to be erected in honor of their famous citizen. In the Consolation to his Wife, Plutarch mentions four sons and at least two survived childhood. Plutarch’s writings are evidence that he was devoted to his parents, grandfather, brothers, his wife Timoxena, and to their children. An incomplete third century catalog indicates that, in the two first decades of the second century, Plutarch wrote between 200 and 300 books and essays. Parallel Lives was written in Attic Greek, which was well-known to the educated class in the Roman Empire. The ponderous work (the extant portion of it contains approximately 800,000 words, or about 1300 pages of fine print) was sent in installments to Sosius Senecio, consul of Rome during the years 99, 102, and 107; through him the work reached Emperor Trajan, who had the means to have many copies made. Plutarch's announced intention was not to write a chronicle of great historical events, but to examine the character of great men as a lesson for the living. He paired a philosophical biography of each famous Roman with the biography of a Greek who was comparable in some way, usually followed by a short essay of comparison. The Life of Theseus/Life of Romulus describes the lives of the founders of Athens and Rome; the comparison of Themistocles and Camillus, describes an Athenian and a Roman who were both sent into exile. Throughout the Lives, Plutarch pauses to deliver penetrating observations on human nature as illustrated by his subjects. Plutarch's Greek heroes had been dead for at least 300 years by the time he wrote their lives (circa 100 C.E. ), making it necessary to rely on old manuscripts, many of which are no longer available. Plutarch’s readers produced enough copies of the Lives over the next centuries that most of the work survived the neglect of the Dark Ages. However, many lives which appear in a list of his writings, such as those of Hercules, Scipio Africanus, and Epaminondas, have not been found. Some of the more interesting Lives, such as those of Heracles and Philip II of Macedon no longer exist, and many of the remaining Lives are truncated, contain obvious lacunae, or have been tampered with by later writers. Plutarch's biographies were moral treatises to which the reader could refer for his own moral improvement. He related, in a more or less chronological sequence, anecdotes which illustrated the virtues and vices of his subjects, rather than giving historical detail. His emphasis on moral rather than historical lessons led him to make odd judgments, such as praising Pompey for his trustworthiness and tactfulness. In the first paragraph of his Life of Alexander, Plutarch explained that he was not concerned with writing histories, as such, but in exploring the influence of moral character, good or bad, on the lives and destinies of famous men. It is not histories I am writing, but lives; and in the most glorious deeds there is not always an indication of virtue of vice, indeed a small thing like a phrase or a jest often makes a greater revelation of a character than battles where thousands die (tr. E.L. Bowie). The Life of Alexander/Life of Julius Caesar is a good example of Plutarch’s method. He presents the Life of Alexander as a collection of short stories, illustrating virtues and vices, rather than a comparative analysis of the causes of the fall of the Achaemenid empire and the Roman Republic. The most important historical theme is that Alexander brought civilization to the barbarians and made them human. This theme is continued in greater detail in The Fortune and Virtue of Alexander. Most authors of books on the Macedonian king took their material from either the "vulgate" tradition (which follows a biographer called Cleitarchus) or from the "good" tradition (which follows the account of Ptolemy, one of Alexander's generals). Plutarch takes elements from both sources and tells his own moral story. Life of Alexander is one of the five surviving tertiary sources about the Macedonian conqueror, including anecdotes and descriptions of incidents that appear in no other source. Plutarch’s portrait of Numa Pompilius, an early Roman king, also contains unique information about the early Roman calendar. Plutarch’s sincere interest in his subjects as human beings and his insights into human character made the Lives very appealing to its readers. A twelfth century official of the Byzantine church, John Mauropos, prayed that on the Day of Judgment, when all non-Christians would be sent to hell, God would save the soul of the Sage of Chaeronea. The remainder of Plutarch's surviving work is collected under the title of the Moralia (loosely translated as Customs and Mores), an eclectic collection of seventy-eight essays and transcribed speeches. It includes On Fraternal Affection—a discourse on honor and affection of siblings toward each other; On the Fortune or the Virtue of Alexander the Great—an important adjunct to his Life of the great king; On the Worship of Isis and Osiris—a crucial source of information on Egyptian religious rites; and On the Malice of Herodotus—which may, like the orations on Alexander's accomplishments, have been a rhetorical exercise, in which Plutarch criticizes what he sees as systematic bias in the work of Herodotus. There are also more philosophical treatises, such as On the Decline of the Oracles, On the Delays of the Divine Vengeance, On Peace of Mind; and lighter fare, such as Odysseus and Gryllus, a humorous dialogue between Homer's Ulysses and one of Circe's enchanted pigs. The Moralia was composed earlier than the Lives, which occupied much of the last two decades of Plutarch's life. Some editions of the Moralia include several works now known to be pseudepigrapha (wrongly attributed to the author): Among these are the Lives of the Ten Orators (biographies of the Ten Orators of ancient Athens, based on Caecilius of Calacte), The Doctrines of the Philosophers, and On Music. One unknown "pseudo-Plutarch" is considered responsible for all of these works. Though the thoughts and opinions recorded are not Plutarch's and come from a slightly later era, they are all classical in origin and have value to the historian. The soul, being eternal, after death is like a caged bird that has been released. If it has been a long time in the body, and has become tame by many affairs and long habit, the soul will immediately take another body and once again become involved in the troubles of the world. The worst thing about old age is that the soul's memory of the other world grows dim, while at the same time its attachment to things of this world becomes so strong that the soul tends to retain the form that it had in the body. But that soul which remains only a short time within a body, until liberated by the higher powers, quickly recovers its fire and goes on to higher things. It is clear that Plutarch’s aim was the moral education of his readers. Moralia includes essays with titles such as Checking Anger, The Art of Listening, How to Know Whether One Progresses to Virtue, and Advice to Bride and Groom. Plutarch's central theme seems to have been the concept of a dualistic opposition between good and evil principles in the world. Later philosophers of the neoplatonistic school disagreed with this idea, and this may explain why several of Plutarch's more serious philosophical publications are now lost, leaving only some lighter works, together with his attacks on the Stoa and Epicureanism. Ralph Waldo Emerson and the Transcendentalists were greatly influenced by the Moralia (Emerson wrote a glowing introduction to the five volume nineteenth century edition of his Moralia). Boswell quoted Plutarch's line about writing lives, rather than biographies in the introduction to his own Life of Samuel Johnson. Other admirers include Ben Jonson, John Dryden, Alexander Hamilton, John Milton, and Sir Francis Bacon, as well as such disparate figures as Cotton Mather, Robert Browning, and Montaigne (whose own Essays draw deeply on Plutarch's Moralia for their inspiration and ideas). The rediscovery of Plutarch's Lives stimulated popular interest in the classics at the beginning of the Italian Renaissance. Epitomes, written in Tuscan and other local dialects, and including highlights of the best stories from Lives, circulated as popular literature. The middle class all over Europe read the popularized Plutarch for its practical wisdom. "We dunces would have been lost if this book had not raised us out of the dirt," said Montaigne of the first French edition (1559). C. S. Lewis concluded that, "Plutarch's Lives built the heroic ideal of the Elizabethan age." Sir Thomas North prepared the first English edition (from Amyot's French edition) of Plutarch's Lives in 1579, and Shakespeare borrowed heavily from it. In 1683, a team of translators headed by John Dryden authored a complete translation from the original Greek. Beethoven, growing deaf, wrote in 1801: "I have often cursed my Creator and my existence. Plutarch has shown me the path of resignation. If it is at all possible, I will bid defiance to my fate, though I feel that as long as I live there will be moments when I shall be God's most unhappy creature … Resignation, what a wretched resource! Yet it is all that is left to me." Facing death in Khartoum, General Gordon took time to note: "Certainly I would make Plutarch's Lives a handbook for our young officers. It is worth any number of Arts of War or Minor Tactics." Ralph Waldo Emerson called the Lives a "bible for heroes." "Wickedness frames the engines of her own torment. She is a wonderful artisan of a miserable life." "It is a desirable thing to be well descended, but the glory belongs to our ancestors." "The real destroyer of the liberties of the people is he who spreads among them bounties, donations and benefits (largess)." Plutarch; Clough, Arthur Hugh (Editor), James Atlas (Introduction), John Dryden (Translator). Plutarch's Lives Volume 1 .Modern Library; Modern Library Paperback Ed, 2001. Plutarch; Clough, Arthur Hugh (Editor), James Atlas (Introduction), John Dryden (Translator). Plutarch's Lives, Volume 2 (Modern Library Classics) Modern Library; Modern Library Paperback Ed, 2001. Plutarch; Kidd, Ian (Editor). Robin H. Waterfield (Essays). Penguin Classics, 1993. Plutarch page at LacusCurtius (twentieth century English translation of most of the Lives, On the Fortune or Virtue of Alexander, On the Fortune of the Romans, Roman Questions, and other excerpts of the Moralia).